Orthopaedics a branch of medical science deals with the disorders and injuries of your musculoskeletal system. The musculoskeletal system includes joints, ligaments, bones, tendons, nerves, muscles which will allow us to move, work and be active. Knee and Shoulder India is a healthcare institution particularly dedicated to knee and shoulder disorders. 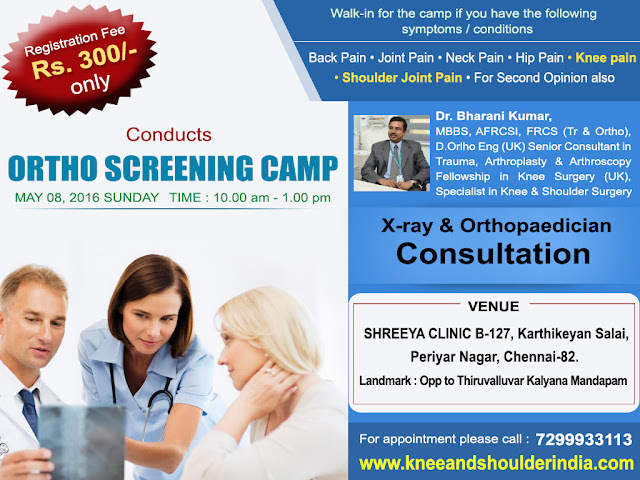 Dr Bharani Kumar Dayanandam, a well known Orthopedic Doctor in Chennai with 15 years of experience in the field of Trauma and Orthopaedics offers sophisticated and advanced treatments for all types of Knee and shoulder disorders. at 10.00 am to 1.00 pm. This camp will help you to identify all your musculoskeletal system disorders and rectify it. Let’s Join With Us and Make It a Success !!!!! !